Golden Globe Turnips – 1.5+ lb. Baby Arugula – .38 lb. Sweet Potatoes – Orange & Korean White Varieties – 5 lb. Golden Globe Turnips – This is the first year we’re growing this variety. They are delicious roasted or try this week’s recipe. Parsley – I’ve been mincing parsley and adding to all of our soups. It’s especially good in minestrone or chicken soup. Broccoli – We’re finishing up the harvest, so everyone is getting one head this week. I’m using mine in a broccoli quiche – it’s just the right amount! Guy Lon – Also known as Chinese Broccoli – you can eat the leaves, the florets and the stems! Chop up in 1″ pieces in stir-fries or just steam and toss with garlic and olive oil. Sweet Potatoes – Your shares include a mix of two different varieties. You’re probably very familiar with the orange flesh and skinned type. The other is white fleshed with purple skin, and it’s a special Korean variety that we tried growing for the first time this year. We’ve been blown away by its super sweet and nutty flesh. What do you think? Should we grow it again next season? Just wash the skin and pop these whole in the oven at 350F until soft. It’s the easiest and best way to prepare them. 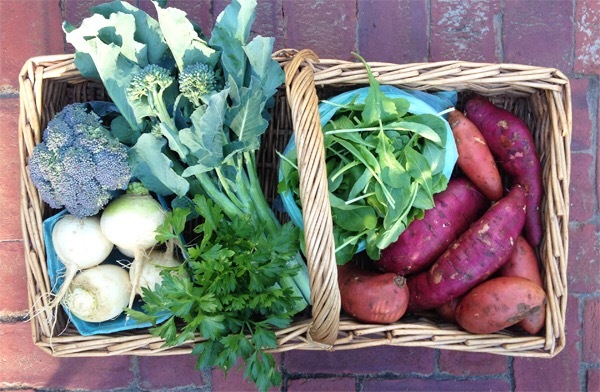 The deadline to register for our Early Winter CSA Program is November 9th! This program is separate from our 26-week Full Season CSA. It consists of 3 deliveries (spaced 2 or 3 weeks apart) starting in December. The winter share boxes consist of our own CERTIFIED ORGANIC root vegetables and storage crops like Potatoes, Sweet Potatoes, Watermelon Radish, Carrots, Beets, Rutabaga, Winter Squash, and possibly Broccoli, Kale and Cabbage. Exact contents may change. We also offer a Cider and Apple Share from Briermere Farms that is not organic.